This time it’s not about a religious matter. Once again, the topic of food comes to occupy first place on the scale of priorities of the natives of my planet. Despite the fact that the Eleventh Biennial is the great cultural event of the moment, the desperation over lack of food is leading to panic in the unhappy mothers and housewives who have the arduous mission of of putting at least one hot meal on the family table each day. Yesterday a friend dropped by and suddenly gave an unexpected turn to the conversation by asking me: “You guys, how are you eating?” Clearly it took me by surprise just when we were talking about the Biennial. This question, which to anyone might could have seemed a bit indiscreet, made sense to me; I understood her intention perfectly. 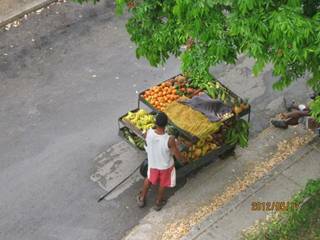 The neighborhood carts, that bring a variety of fruits and vegetables almost to the doors of the houses, a little more expensive than the supplies at the state farmers markets, but of excellent quality and nicely presented, have disappeared. I can think of one I happened to run into hiding under a tree. Even after having been authorized and paid for their licenses, they’ve been banned from this area (mostly residential), where it happens there are a lot of homes for rent to tourists and paladares — the private restaurants. The carts have been confined to offering their products only around the State markets. This has made getting these products even more difficult, just when the supplies in the hard currency stores are facing their worst time. For some months these stores have lacked milk products, oil, meat, just to mention a some items. On the other hand, the only butter available is imported, with an incredibly high price, such that almost no one is inclined to buy it. All this without mentioning the dark and dirty establishments where they offer the almost non-existent products of the infamous ration book. All this, plus the inertia that has overtaken the regime, has put a yoke of despair on the spirit of the citizens. The government keeps talking about reforms, to be introduced over the long term bit by bit. They are entertaining us and trying to buy time, but every time we are left with less, and we keep on seeing, painfully, how our young people think of the possibility of abandoning the country as the only solution. Meanwhile, we are becoming a society of old pilgrims. Right now the Eleventh Havana Biennial is going on. Any cultural activity that takes place on these dates, would remain, as the official language usually says, “inside the framework of the Eleventh Biennial.” But that is not the case. This exposition of alternative humor, CROCODILE SMILE, opened yesterday, May 18, 2012, just inside the box, but definitely outside the frame. 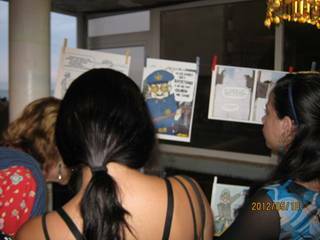 The event was organized by Estado de Sats, with the collaboration of famous Cuban cartoonists, from inside and outside the island, among which we see signatures such as Alfredo Pong, Garrincha, Carlitos, Gugulandia, Polo, Katungo, and Santana, just to name some. Also projected were some humorous shorts sent courtesy of TeleGuamá. It was an unforgettable evening. Where adults and children, artists and public, all enjoyed ourselves. 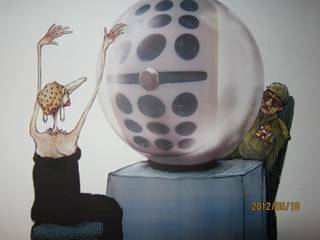 Once the event ended some of the cartoons displayed were raffled off. In the Absence of Bread, Circuses! The purpose of the Eleventh Biennial of Havana, as in previous editions, is to show the art being made in our country as well as in the world and in other lesser-known regions. From the eleventh day of this month until June 11, the entire capital has been converted into a gallery, exhibiting works by more than one hundred eighty artists from forty-three countries. The main objective of this Biennale, dedicated especially to the so-called third world countries, is to draw in and to interact with the viewer, in the widest reconciliation of dreams, utopias and artistic practices of popular imagination. 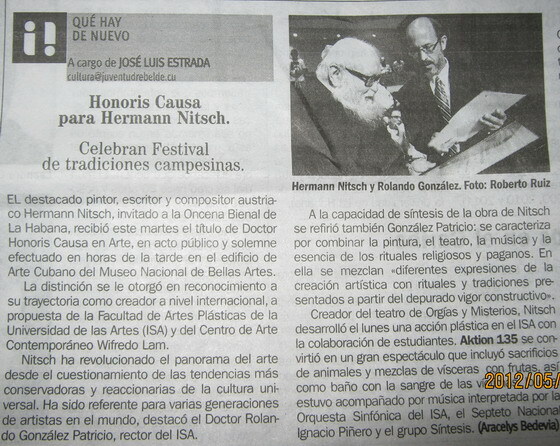 Now, reading in the cultural page of the newspaper Juventud Rebelde on Wednesday the 16th of this month, the article on the octogenarian Austrian artist Hermann Nitsch, I could not help but feel disgust and indignation, with his performance Aktion 135. This distinguished painter, writer and Austrian composer, guest of the Eleventh Biennial, on Tuesday received an honorary degree in Art. With all due respect that this artist merits for his career in the arts, I can not at all agree with this work, which includes the useless sacrifice of animals. Of course, this happens in a country where there are no laws that protect civil societies and protect them. It is useless to raise my voice here, where there is no echo, but it would be good for the protective institutions of animal life, which exist and function in the vast majority of civilized countries, to take account of this criminal act, where art is taken as an excuse for animal abuse, in the eyes lazy and complicit officials and spectators. It is clear once again that when a government cannot assure its citizens bread, they give them circuses, and in this particular case, one stained with blood. 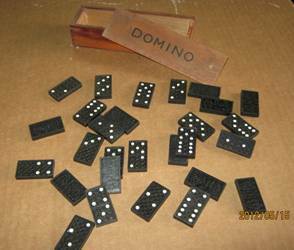 On my planet dominoes have been and continue to be the most popular table game. Game played with twenty-eight rectangular tiles, generally white on the face and dark on the reverse, with each divided into two squares, each one of which is marked with from one to six dots, or with none at all. Thus says the Volume I of the Encyclopedia Espasa-Calpe, sa. Madrid 1035 (third edition). But we Latinos, we like to do more complicated things, we add to make it fifty-five tiles in total, and there reigns the dreaded, unwanted, hated and sometimes loved double nine. Double Standard: To express in public the exact opposite of what you really think, and say, behind closed doors. Double Currency: One, with which they pay our meager salaries and retirements, which has barely any value, and another which, even though it’s only good inside the country, at least can be used to acquire most of the basic necessities, and that must be gotten and spent at your own risk. Double Health: One very precarious and lacking in resources, which is offered to the people. Another more specialized, with a wide range of medicines and better facilities for the leaders and foreigners. Double Education: One very deficient, with schools in a terrible state and most improvised teachers. And the other with very good conditions and qualified teachers for the diplomatic corps and a very few privileged Cubans. 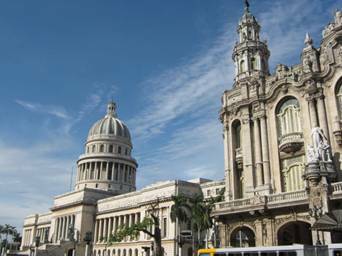 Double Market: One, with little variety in products and prices extraordinarily inflated (more than 250% of costs), and the other in the so-called Cuban Convertible Pesos. 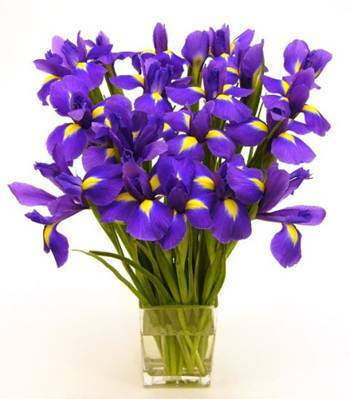 And another only for diplomats and senior leaders, with more varied products and better prices. Double Migratory Law: One, draconian and violating human rights, which is applied to the population in general, and another, more expedited and economical, that favors only the leaders and high officials. Double Supply: Almost nothing for the people’s markets, and another with home deliveries in record time, for the ruling elite and selected officials. Double Justice: The surprisingly cruel, pompous and media focused applied to citizens who violate the law, and another quiet, almost secret and less aggressive, applied to officials who have committed crimes against the economy. Double Information: One, transmitted to the population through all the official media, and another of antennas and Internet, fiercely persecuted, which only a few privileged have access to. As you see, there are various doubles. Now we just have to focus on the table, calculate how many tiles are still to come, and above all, try to guess who is crouched over the double nine, because in any moment he can play it and that’s the game! As I told you, this may be the most uncomfortable and surprising tile, of this other twisted entertainment. “If the Cuban were to travel more he would be able to see more and value more, by contrast, the good things of his country,” he continues in another paragraph. 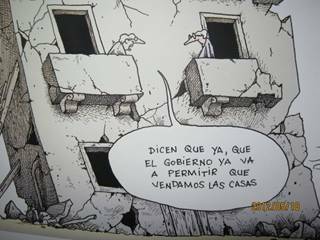 If there is a guilty party in all this deformation of the Cuban, it is due principally to the government which, during the last half century, has treated its own people like third class citizens. At first they enclosed us on this little island, without permitting us to have contact with the outside: that lasted several decades. The only valid references were the Cuban dailies and some Soviet magazines. We who worked were prohibited from writing to our family or friends in capitalist countries, above all in Europe, on pain of losing our jobs. Remember that the State was the only employer. Likewise, particular trips were prohibited or extremely restricted. All this served to intensify the material misery and therefore morale. A feeling of distress began to grow because of not possessing the most urgent articles, which was transformed little by little into envy towards those who had access to them. The few trips to the outside were for the party militants or the youth with the most proven loyalty to the regime. Here it began to get worse and to develop the double standard. One had to pretend and pretend well in order to be deserving of the trust and, therefore, of the little trip that would permit us to breathe a little and to be able to bring shoes and clothes to our relatives, and in a plastic bag the little food that the airplane let us ingest, so that the child at home or the old one could enjoy it. Economizing to the max on food, although that would involve hunger, in order to return to the fatherland with a little money, plus the little soaps gathered in the hotels. With the economic crisis at the beginning of the 1980’s and the lack of tourism, flights from the Comunidad — Cubans abroad — were authorized. Those countrymen of ours who were denounced in meetings when they expressed the desire to leave, these same ones who were insulted and told never come back, now as if by magic would be converted from “worms” (the epithet that had been screamed at them), to butterflies and would come to save the country’s weak economy and to fill a little the empty bellies of the relatives and even some of the neighbors of those who had been insulted. I have here other manifestations of the double standard: lying to keep a job, lying earn a little trip, lying to be able to enjoy a reunion with family and friends and lying to try to contain proportionate happiness, at least publicly. 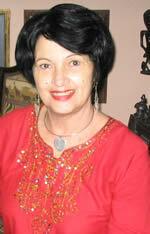 Now, many years have passed, the Special Period that started at the beginning of the 1990’s does not seem to have ended. Because of that, as soon as tourism began to increase, the siege of the visitors increased at the same time. The bid to see who is the most favored has made many men, women and even children seem like street clowns, trying to win over the foreigner, which is likewise a cunning way of begging. One must not blame only the suffering people; one must consider the circumstances that have surrounded all this moral deterioration. When a society loses its civility, loses the family and all its values, anything can be expected from it. Cuban pride is very battered. That national feeling that we used to have, that made us walk with our heads held high and treat others correctly, without difference, including the tourists, without having to lower our s ingratiate ourselves, we have been losing it almost without noticing. The daily urgencies and the lack of good education, have made us underrate ourselves. I remember when I was a girl, for us a tourist was more ordinary. The only thing that sometimes made us turn our faces towards them was the bright attire that they wore. As far as the flower vendors of Old Havana, I believe that the costume is excessive or unnecessary. It seems when one walks through the restored streets in that part of the city that one is moving on a movie set. This is too much for me, just like the flattery and mollycoddling that they dispense to the tourists provided that they buy the merchandise that they offer. It would seem that in the whole colonial zone, they were the estates of the big movie companies.